Tiki is the first man, according to Maori mythology. He found the first woman in a pond, and that led to the start of a family that essentially created all of humanity. His likeness can be found in statues all throughout the South Pacific, representing deified ancestors in those cultures and marking the boundaries of important, sacred places. Inspired by the Polynesian islands, the Jeep Wrangler Islander edition introduced a new design flair for drivers. Featuring unique interior colors, eye-catching exterior colors including a Surf Blue Pearl Coat, black sidesteps and 17-inch wheels equipped with 32-inch tires. The highlight of the design was the inclusion of a new logo featuring "Tiki Bob." Appearing on the seat and outside, the logo was displayed at its largest on the tire cover. 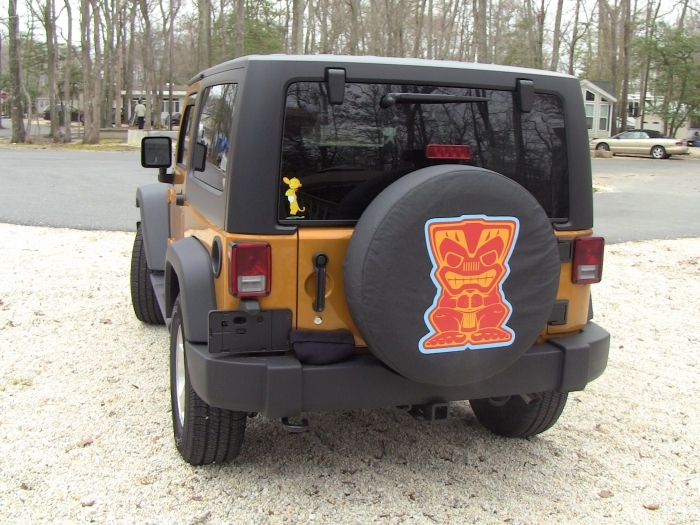 Just for Jeeps will let you restore Tiki Bob to his rightful place on your Jeep Islander. Emblazoned on black soft material, this tire cover is made by OEM Mopar, the very company that built the parts you see on the showroom floor. That means the graphic exactly matches every other instance on your Islander. 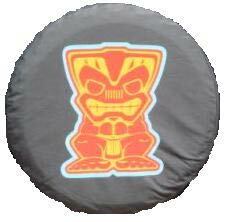 Embrace the spirit of the islands with this cool Jeep spare tire cover, made to fit your Wrangler or Liberty. ProsCover fits perfectly and made of good quality. Fast shipping thank you !! Great product . This is a very good, quality-made item that dresses up my Islander Edition and was missing when I purchased it. Very fast service and packaged well, will do business with again. Awesome looking cover. Adds a real "cool" factor to our jeep. Fit perfectly. Quick shipping.